ISRAEL TOPS CYBER-ATTACK READINESS WITH FINLAND AND SWEDEN RIGHT BEHIND……. – The Tundra Tabloids……. 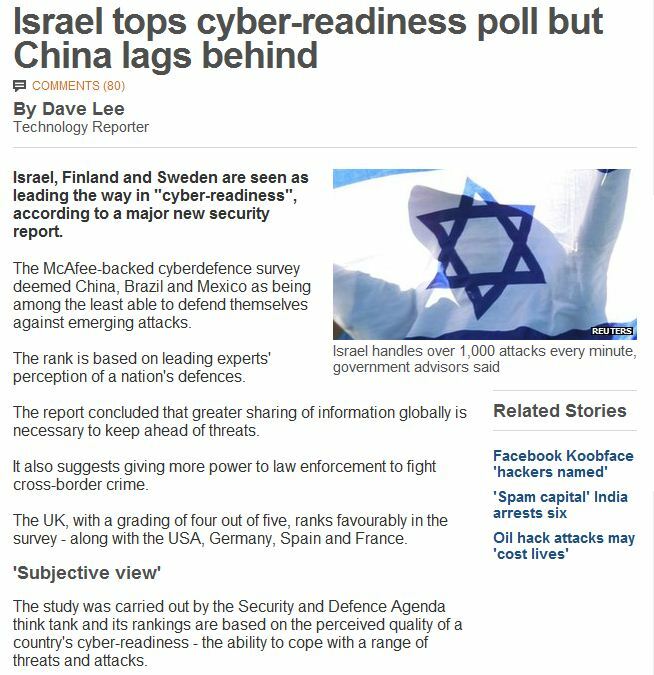 ISRAEL TOPS CYBER-ATTACK READINESS WITH FINLAND AND SWEDEN RIGHT BEHIND……. Staying ahead of the hackers and attackers is a never ending job. Previous Post Previous Post DR.MANFRED GERSTENFELD INTERVIEWS PROF.MAURICE ROUMANI, EXPERT ON LIBYAN JEWRY……. Next Post Next Post ISRAELI MI CHIEF: IRAN HAS ENOUGH NUKE MATERIAL FOR FOUR BOMBS…….